This summer my parents and I bought a farm in central-west, or is it west-central mass? Well either way, it’s a plot of land with an old farmhouse, barn, and shed about 10 miles off the scenic Mohawk Trail (Rte 2) in Warwick, MA. There’s 67 acres, most of which is still forested with somewhere between 6 and 10 acres cleared. There is a small river, a pond*, and several streams and springs on the property that not only gives the plot a great potential but also the picaresque, farmhouse aesthetic. While the cleared fields, or meadows, are quite classic, the forested parts are my favorite. One moment you’re standing in a dense patch of underbrush, and the next you’ll be walking through a mossy, fern-covered understory. Along the stream that cuts the property basically in half is this beautiful ridge formation with the stream at the bottom that you look down into. Imagine how a canyon is setup and that’s what it looks like, just with more pine needles, leaves, and more than a little bit smaller. Instead of telling you this, let me show you what I mean. Here are some photos from the last time I was up at the farm. First we should look at a general overview of the property, so here is a little map I put together. 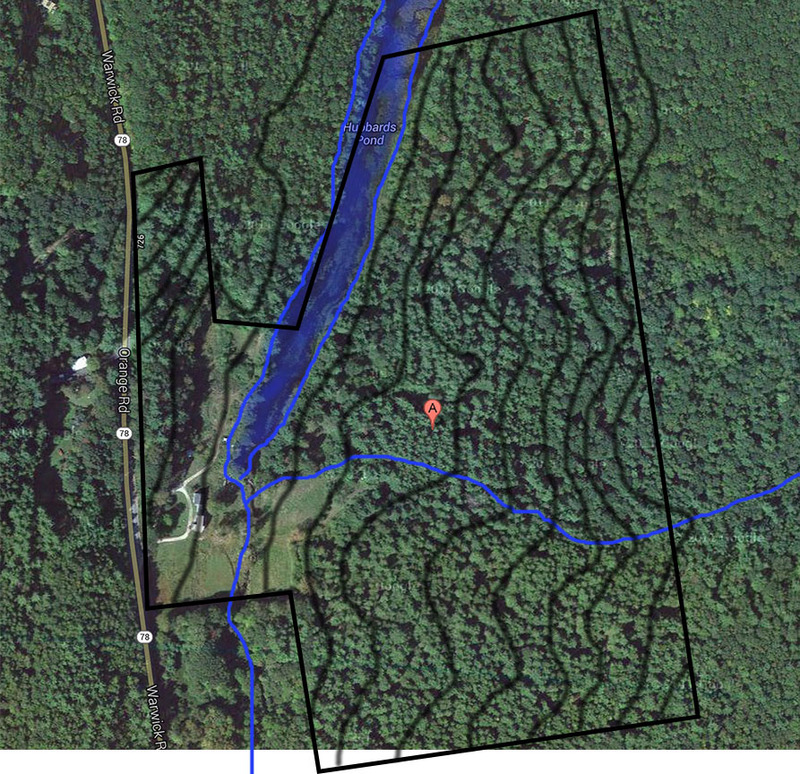 You see the farmhouse right off the road, and then the outlined area is, clearly, the 67 acres of the property. Notice that when you drive into the property that the river flows south directly behind the house and that all the cleared land is directly adjacent to the house and river. The pond, Hubbard Pond lies within sight of the farm house and no more than ~80 ft from it. Here we have a photo of the farm house itself with a new, tin roof that we installed. The house clearly needs a fair bit of work, but since my parents and myself are very capable this will be an interesting and worthwhile use of our skills. The windows are also new, thanks to the Hubbard family, but just about everything else either needs to be replaces or otherwise updated to some extend. Regardless of the work still to be done, the buildings are absolutely beautiful in their own way. From the left to right the buildings can be broken up into the main house, the kitcken/storage area, and the barn. The barn surprised us all since it has both a loft–like many barns–and a set of stables underneath. Since the who structure is built on a hill, the back of what should be the basement of the barn is exposed in back and contains three pens or stables for horses, goats, or what have you. The pond is clearly beautiful; here is a photo from atop the old dam. Yep, you read that properly, a dam. The remains of the old saw mill and dam still direct and channel the flow of the river. The saw mill itself is long gone, but the foundation hints at the history of this property. From the pond, the river flows through the property, parallel to the road, and directly behind the house. Photos of both upstream and downstream of the bridge into the back fields are also included. The lake and a beaver lodge. In the forest there are also a couple streams, the main one of which is absolutely gorgeous! It flows into the pond right by the dam and probably the reason the dam was built where it was. With it I have included a photo of what some of the forest looks like, a mossy area with lots of pine needles. Now I don’t have photos for all of the various areas back there and I wont even try to describe them here except to say that all sorts of foliage and ground cover exists in the understory making it an ideal example of biodiversity! 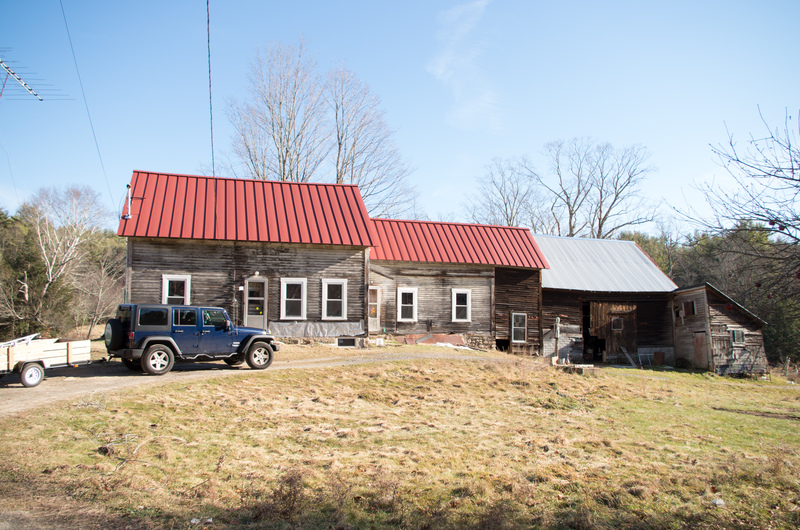 While it is much too early to try to predict the future of this property, the ultimate goal is to have it as a family property for generations to come. The property is already shaping up to be a big part of my life, and my brother’s, so I’m thinking of trying to grow grapes and hops there in order to make some money and to enrich our use of the land a bit. Only time and the land can tell us if this is a reasonable hope, so next spring we’ll plant a wide range of test plants in order to assess the soil quality and climate at the farm. Wish us luck! * According to InfoPlease.com, a lake has a “wave-swept ‘washed’ shoreline” (site). Therefore, the body of water on the property is not a lake as I originally thought.